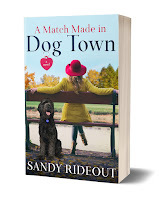 I had never heard of the Barbet, or French Water Dog, until Riggs and I met Nikki and her owner on the snowy trails of the Don Valley ravine system. Over the next months, the dogs became best pals, and I came to appreciate all the Barbet had to offer. 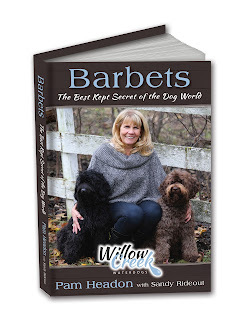 Nikki's breeder, Pam Headon of Willow Creek Waterdogs, agreed to let me help with her book on the breed, called Barbets: The Best Kept Secret of the Dog World. I really enjoyed working with Pam, and still keep in touch to find out the latest Barbet news. She's kindly agreed to share her experience of the Barbet here, for our first Meet the Breed (and Breeder) entry. Over to Pam . . .
1. What made you start breeding dogs? 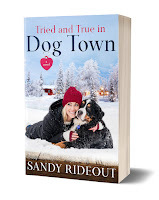 True confession: Once upon a time, I had a purebred Cocker Spaniel that I continue to call the “Spaniel from Hell.” Tammy was really my son’s pet, and despite my experience with dogs, I failed miserably in housebreaking her. I sensed that my busy household was too stressful for Tammy, and that she would fare better as the “only child” of a doting couple. So I convinced my son to let the Humane Society find that perfect home for her. The deal was that if they re-homed Tammy, he could choose a new puppy. In due course, they found a great placement for Tammy, so we went to check out a litter of what they said were German Shepherd-Collie crosses. I thought that would be an ideal family dog. There were 13 pups in the litter, and my son selected his favorite, a curly black-and-white pup that was much smaller than the rest. He named her Oreo. I’d owned Shepherds and Collies and crosses thereof, but Oreo didn’t resemble any of them. Compact, adorable and spunky, she followed me like a shadow. Still, there was nothing overt to suggest a more exotic pedigree than the typical pound puppy until I took her to a county fair a few months later. Over the course of the day, three people came up to me separately to ask about my Portuguese Water Dog. Curious, I headed to the library to look at some breed books. Sure enough, Oreo did resemble a Portuguese Water Dog, or “Portie.” She had webbed paws, she didn’t shed, and she was maturing to be about the right size. She also had an intriguing habit of sitting on top of the barbeque to survey the backyard as if she were on the bow of a boat. Even a Portie breeder who met Oreo thought she was likely a purebred. I had Oreo spayed and that should have been the end of it, but a seed had been sown. I decided I wanted a purebred Portuguese Water Dog. There were only a few breeders in Canada at the time, and one lived quite close to me, in the Kitchener-Waterloo area. I visited and told her the story of Oreo. Under her mentor-ship, I began breeding Porties myself and it launched a new, happier phase of my life. 2. How did the Barbet enter the picture? I bred Porties happily for many years and consider them my first canine “love.” But then I discovered the Barbet. This ancient breed is similar to the Portie in all the best ways, but people who know both breeds well tend to agree that the Barbet is a calmer, easier dog. In fact, I called one of my first imports “Sanka” because she struck me as a decaffeinated Portuguese Water Dog. As a responsible breeder, I have steered many prospective owners away from the Portie because the breed requires a lot of exercise and strong leadership. Happily, I can now steer them toward the Barbet, which is an ideal match for almost anyone. Though bred for hunting and sporting activities, the Barbet is a highly versatile dog that can flourish in rural or urban environments, in houses, cottages or even high-rises, providing their individual exercise needs are met. Few breeds are so adaptable. This breed is still so rare that it seems like a secret we Barbet-lovers share. There are not even enough Barbets in the US to be AKC-recognized, although it is getting close. It’s nice to be breeding a dog that has a rich, long history as a purebred dog in France. They say Napoleon owned one! 3. What’s changed in your life since your book, Barbets: The Best-Kept Secret of the Dog World came out? I love that more and more families are familiar with the Barbet and know it’s the dog they must have even before they even contact me. It makes my job easy! The book ruffled a few feathers in the breeder community when it was published, but now people seem to recognize that a book on this rare breed raises its profile in a positive way. 4. What was your biggest surprise as a breeder? The vast majority of Barbets are either black or brown, with a few fawn colored dogs in the world. Last fall, a black Barbet, Nikki, surprised me by delivering a light-colored pup with phantom markings. To my knowledge, this is the only Barbet with this coloring. If all goes well, I hope to breed this dog, and am super excited to see what kind of pups he’ll produce. 5. What was your favorite moment as a dog breeder? Hands down, it was the moment Sarah Leal described so well in my book. I’ll share her version of the story here. We got Callie for the simple reason of bringing joy into our family. We have a stressed house: my daughter Madison is medically fragile, and we don't know day-to-day what's going to happen. You need to find a way to laugh in between the moments of stress, and Callie helps us do that. People thought I was crazy when I said I wanted a dog, but I had an overwhelming urge, and it was the right decision. Callie is absolutely wonderful. She loves dogs, our cat, the bus driver, and the nurses who help Madi—everyone. I had been interested in a Portuguese Water Dog, because Madison has allergies. Madi also has Cerebral Palsy, and when Pam met us, she suggested that the Barbet might be better fit, because it’s a less energetic breed. I wanted a dog that would love swimming, and be affectionate and loyal to us, and Pam assured me the Barbet would meet those requirements and more. When the puppies were two weeks old, we went back and chose Callie. Since we live close to Pam, we were able to visit often. 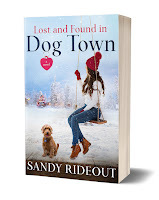 A week before the puppy came home, Pam took a T-shirt Madi had worn to help imprint Callie. When we came to pick up the puppy, Callie acted like she recognized Madi. She snuggled under Madi’s chin, and it was like she was saying, “Oh there you are—I was looking for you.” We put down the accessible ramp and Callie followed Madi right up the ramp and into the van. Pam burst into tears and said, “This is beautiful: it’s meant to be.” And it was. She’s so loyal and connected with us. A few weeks ago, Madi had a medical crisis in the night, and the nurse had trouble with the intercom. I woke up because the dog was making a noise I’d never heard before—it was a pained sound. Callie clearly knew something was wrong in Madison’s room and was alerting us. We needed to get in there, and she made it happen. 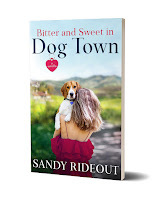 You can learn more about Pam and her work at Willow Creek Waterdogs. Please follow the Animal Magnetism blog if you'd like to receive updates as they're posted. If interested in being interviewed, contact rideoutsandy@gmail.com. 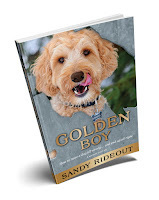 Sandy's latest book is Golden Boy: How to raise a dog all wrong and end up all right.